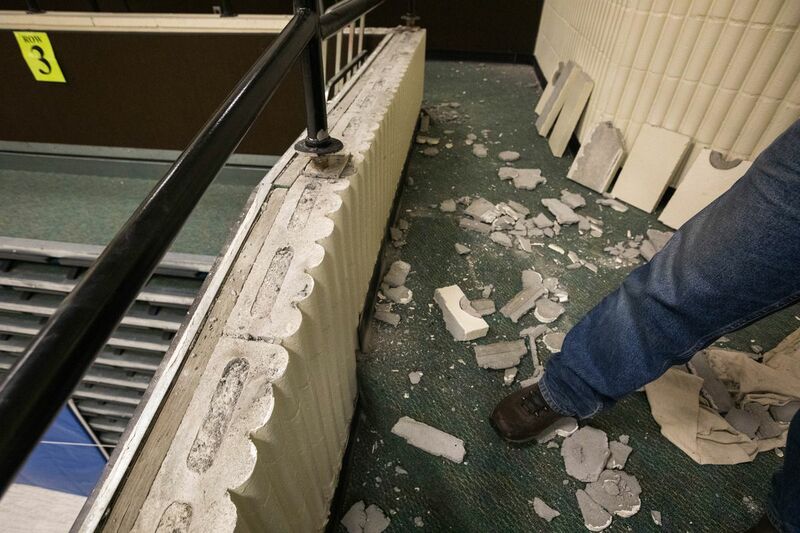 There won’t be many days off for students, parents, teachers, administrators and Anchorage School District officials in the coming weeks as they scramble to come up with plans for what to do about a pair of quake-damaged schools in Eagle River. “We have a very short window,” Anchorage School Board President Starr Marsett said at a Monday night board meeting, where an ad hoc committee was formed to study options for Chugiak-Eagle River schools even as the district waits for engineering reports on damage to the most severely damaged facilities. Gruening Middle School and Eagle River Elementary School have been closed since Nov. 30, when a magnitude 7.0 earthquake slammed Southcentral Alaska. The quake damaged many structures in Chugiak-Eagle River — where nearly half of the most heavily damaged schools in the district are located — and was particularly impactful at the two schools, which have been closed through at least the 2019-20 school year. On Jan. 31, President Donald Trump declared the quake a federal disaster, which — according to ASD chief operating officer Tom Roth — set in motion a fast-moving chain of events. Federal Emergency Management Agency officials began arriving in Anchorage last week, and in about two months, local, state and federal officials will agree on how to best move forward. Roth said the district will meet with FEMA in the next few days; after that, the clock is ticking. Roth said the district is still waiting for engineers to complete a structural and architectural analysis, which will give officials a better idea of the extent of damage at the two schools. But at the work session, he said, all options are on the table. Closing the school entirely would necessitate an increase in capacity at other area schools, he said. Roth said it’s possible FEMA could cover as much as 75 percent of the costs associated with repairing or replacing the schools. But funding for any future projects has also yet to be decided. The district is in the process of scheduling initial public meetings to discuss both short- and long-term solutions for Gruening Middle School and Eagle River Elementary. ASD superintendent Dr. Deena Bishop said it will be crucial for all stakeholders — from students, parents and teachers to local businesses — to weigh in. “It’s really going to take the entire community,” she said. The district has not yet announced any dates or times for the meetings. On Tuesday, ASD spokeswoman Catherine Esary said she “may likely have a press release” on Wednesday announcing meeting times and dates, but she couldn’t be certain. Assistant superintendent Dr. Mark Stock said the reason the meetings haven’t been finalized is the committee was only formed Monday. “We’re just trying to work with the board and not get ahead of them," he said. Potential long-term options for Gruening, built in 1983, include either repairing or replacing the school, or possibly creating a middle/high school at Chugiak High or Eagle River High. Another option might involve moving Eagle River High students to Chugiak and moving middle schoolers to Eagle River High School. The district could also combine Gruening with Mirror Lake Middle School -- though Roth pointed out that would put either school well over capacity. According to the district, there are currently 587 students attending Gruening and 666 at Mirror Lake, which has a capacity of 978 students. Chugiak High’s current enrollment is 886, while Eagle River High’s is 819. Combining the schools would put about 1,700 students in a school designed to hold 1,618. Since the quake, students from Gruening have been attending classes at Chugiak High School, which was already under capacity and has been able to integrate the younger students with relative ease. The school currently houses about 1,473 students, about 91 percent of capacity. “Both administrations have been doing a lovely job trying to work together,” said Chugiak High senior Mara Ditzler, who testified at Monday’s meeting. Ditzler said Gruening students have their own bell schedule and are mostly separated from high school students during the day. Though she praised Chugiak High staff for working to make the transition smooth, Ditzler believes housing Gruening students at Chugiak is not a long-term solution. “I don’t know if the system can work for another year,” she told the board. Ditzler would like to see Eagle River and Chugiak high schools combined at Chugiak, with Eagle River High turned into a middle school housing sixth-, seventh- and eighth-graders. That would keep high schoolers under one roof and ease some of the crowding at the elementary school level, she said. After the meeting, Ditzler said combining the two high schools would be an easy fit. “We’re friends with all of them already,” she said. While the Chugiak-Gruening combination has caused relatively minor disruptions, accommodating Eagle River Elementary students into three different schools — Birchwood ABC, Ravenwood and Homestead — has proven more difficult. Ravenwood is currently at 122 percent capacity, Birchwood ABC is at 118 percent and Homestead is a few students over its 493-student capacity. Birchwood ABC PTA president Valerie Davies told the school board the introduction of Eagle River Elementary students into Birchwood has been a major disruption. “I just want to tell you it’s not working,” she said. The school is overcrowded, she said, and Eagle River Elementary students aren’t held to the same academic and behavioral standards as those at Birchwood. “We have a higher expectation,” she said. Davies said she hopes the district can figure out a plan that will allow Birchwood to return to normal. Continuing as is, she said, won’t work. “It would be very tough on the students,” she said. But there likely will be no easy options, and school board member Deena Mitchell said any solutions will come with some difficulties. “This is going to impact pretty much every student in Eagle River,” she said. Board member Elisa Snelling knows three of those students — they’re her own kids. Board president Marsett said community input will be vital for finding good solutions. CORRECTION: A previous version of this story misidentified one of the elementary schools housing Eagle River Elementary students.